This is part 2 of my seared sashimi extravaganza. Sashimi is a Japanese delicacy. It consists of very fresh raw meat, most commonly fish, sliced into thin pieces. For our last date night, we had sesame-crusted seared salmon sashimi, lemon pepper seared tuna sashimi, and nori-wrapped seared scallop sashimi. I am posting each of the recipes separately. 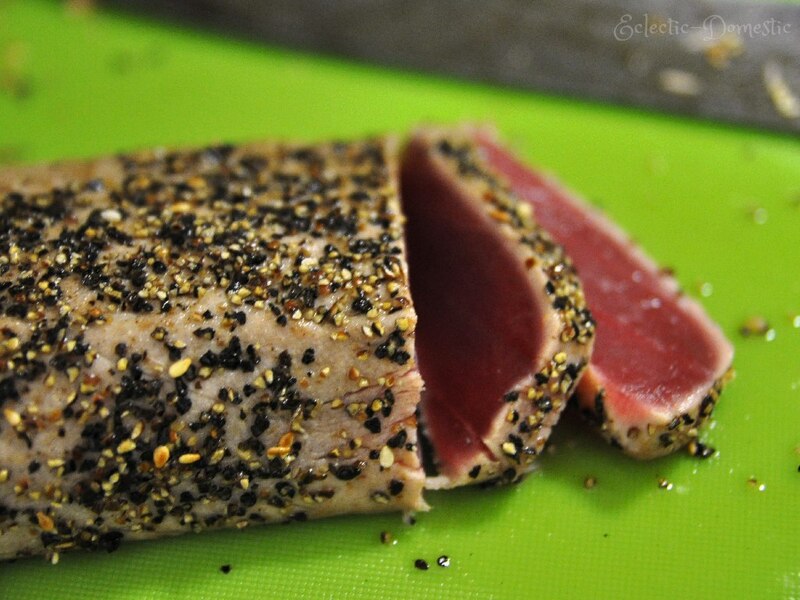 Tuna was the first fish I ever tried raw. I was 16, and my more-worldly friend Suzy took me to a sushi bar on Manhattan’s Upper West Side. After Suzy had convinced me that it really was OK to eat seaweed, I tentatively tried the kappa maki (a sushi roll made with cucumber and rice wrapped in seaweed). To my complete and utter surprise, I did not die right there on the spot! I lived! And I actually rather liked the experience! So, I decided to tempt my fate and try the tuna. And that’s when my love affair with sushi and sashimi began. Since then, tuna has always been the first fish I reach for at the sushi bar, and it’s a staple when I make sushi or sashimi at home. Here’s how I made it as a lemon pepper seared sashimi. By the way, if you haven’t tried lemon pepper, you should. It’s just a bit spicy and has a delicious, citrusy aroma. The two basic ingredients in lemon pepper are lemon zest (surprise!) and cracked black peppercorns (another surprise!). However, commercial mixes may include other ingredients such as salt, onion, garlic, cayenne pepper, or other spices. The lemon zest is mashed or ground together with the peppercorns to allow the citrus oil to infuse into the pepper. The mixture is then baked and dried. (I didn’t actually know all that before I wrote this post, but I looked it up. Gotta love Google!) What I did know, though, was that lemon pepper complements fish and chicken exceptionally well. If you happen to live in a place where you can’t find it, you can also make your own using this recipe. Rinse and pat the tuna dry with a paper towel. Sprinkle with lemon pepper. In a pan with a bit of olive or coconut oil, sear the lemon-peppered tuna on all sides for about 20 seconds. The edges should be seared, but the inside should stay raw. Only the outermost edge should be cooked. 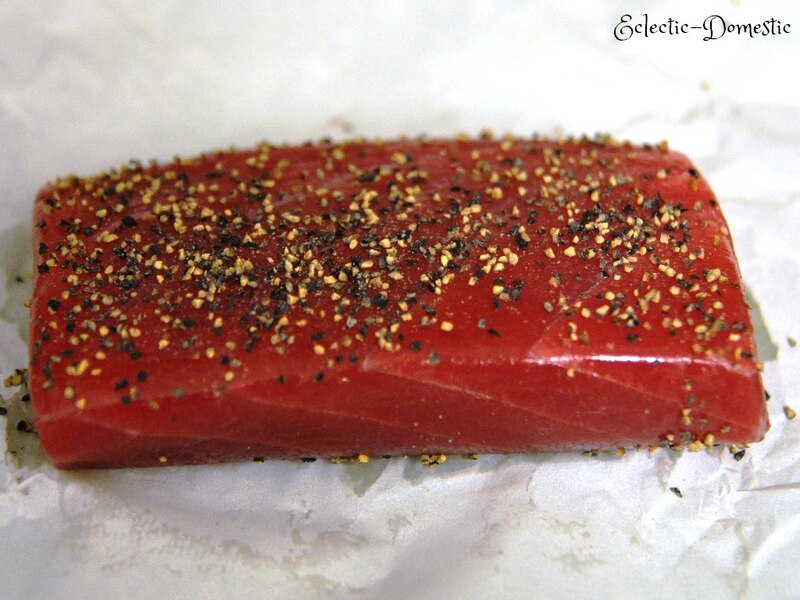 When buying tuna for sushi or sashimi, always make sure to get tail/loin or what’s called a saku block. A saku block is a preportioned piece cut out of the fillet. Do not buy tuna steaks or other cuts of tuna. Because of their size and grain, other pieces cannot be cut properly for sushi. In a pan with a bit of oil, sear the tuna over high heat on all sides for about 20 seconds. The edges should be seared, but the inside should remain raw. Remove from pan. Either chill for an hour in the refrigerator or serve lukewarm. When ready to serve, cut into thin slices (ca. 5 mm or 1/4 inch). The fish will slice more cleanly if it is well chilled. 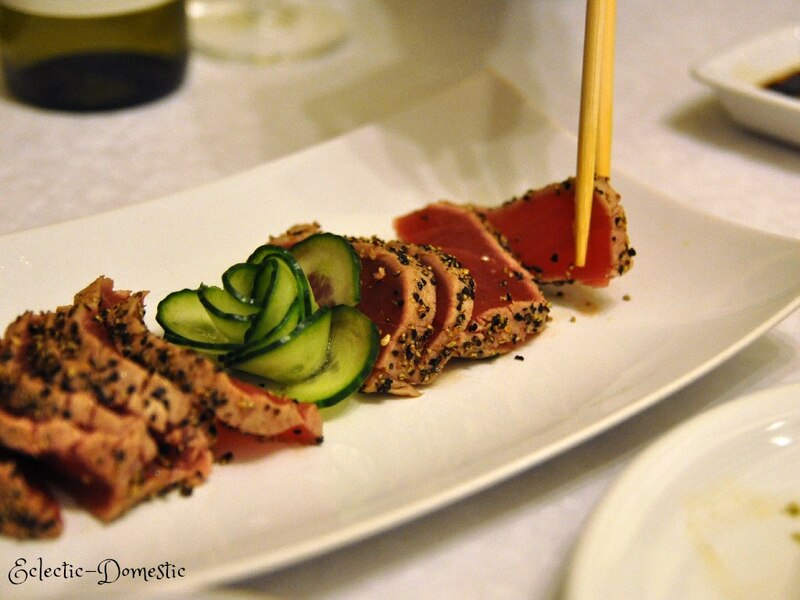 This will serve 2 as an appetizer or, along with other sushi or sashimi, as part of a main meal. Thank you for the tips about buying the proper tuna cut!